In the studio I’m working with producer Adam Sinclair (credits include The Unthanks, Frankie & The Heartstrings) on some new tracks that I released in November. On the live side of things, I’ve just confirmed a tour supporting Jools Holland. That all kicked off in November! Definitely gigging! It’s all a big cliché really, but there really isn’t a feeling like stepping on stage and singing your own songs to people. Tell us a little bit about your recent solo work? I’ve just released a single called “The Numbers”. It’s a little bit of a departure from the music I’ve made over the last few years. My older music was more rooted in the singer songwriter acoustic rock world, but with this new single (and the tracks I’m working on as a follow up), I’m making full use of my 7-piece band and attempting to display the quirkier side of my songwriting. I can pick out a few, but it’s hard to pin down an absolute favourite. A couple of the standouts were quite recently actually. We were booked on a couple of Jools Holland dates back in May (in Perth and Middlesbrough), and that was an experience to remember… really big crowds and a great set of people to work with. Prior to that, singing a duet with Gabrielle Aplin at a couple of her recent UK shows was also a highlight. I’m a huge fan of classic singer songwriters like Dylan and Springsteen and legendary artists like Elvis and Johnny Cash, and they will always be an influence on the way I try to write songs. But truth be told… my music sounds absolutely nothing like theirs! 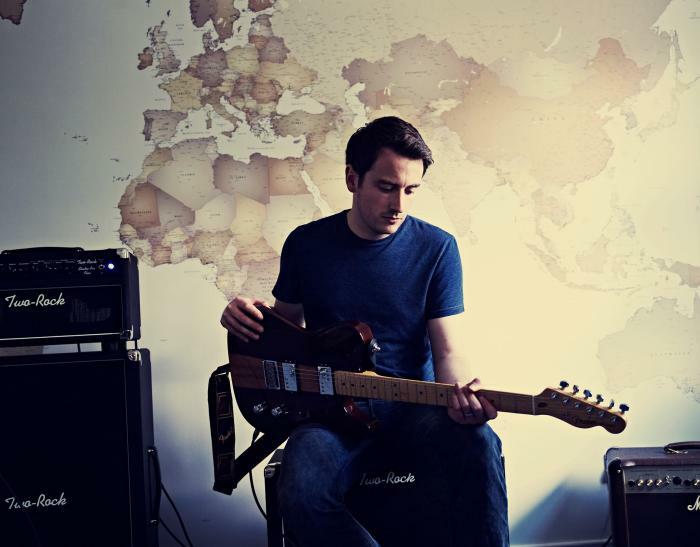 In terms of more modern influences, I listen to and take inspiration from quite a wide range of artists… Beck, John Mayer, Ryan Adams, Ray Lamontagne, Bright Eyes, Gary Clark Jr… the list goes on and on! Definitely the 1950s in Memphis, Tennessee. To set foot in Sun Studios and witness the start of Elvis and Johnny Cash’s careers! I learnt to play on my Dad’s Squier Stratocaster for a few years, before I got my own guitar… an Epiphone SG. My two main guitars are a Fender American Deluxe Stratocaster with Bare Knuckle 63 Veneer Board single coil pickups, and a Fender Select Telecaster HH with Wide Range Humbuckers from Mojo Pickups. Tell us about your El Cap and Flint, what made you chose them? 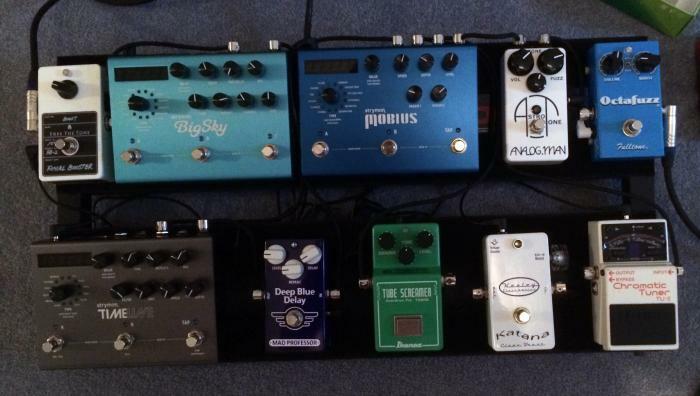 I use the 3 “big” Strymons in the studio (Timeline, Mobius and Big Sky), and I’ve been looking to get a couple of the smaller Strymon pedals for live use as I try to take a smaller setup to shows. My most used effects from the three bigger units are the Tape Delay from the Timeline and the Tremolo from the Mobius, so it made sense to get a couple of the smaller Strymons for my live board to take out on tour. It varies from time to time, but I’m currently using a mixture of Boss (Tuner and DM-2), Ibanez (TS808), Free The Tone (Final Booster and Silky Comp), Keeley (modded Boss BD-2), Vemuram (Neoplex) and Fulltone (Octafuzz OF-2) pedals. Not really. I’m a bit of a hoarder so if there’s a chance that I’ll still use something I’ll try my best not to let it go. I only tend to sell things that I really can’t see myself using often. Can you think of anything that really changed things for you, and why? The Strymon pedals fall into that category for sure. The big 3 units are phenomenal to use in the studio when you have the time to really play around with everything they have to offer. Other than that, when I bought my first real Strat I realised what I’d been missing. That guitar makes me write songs from a completely different angle. It’s hard to describe really. I once heard Paul McCartney say that every guitar has a few secret songs in it… songs that are already there and waiting to be found. I understood that for the first time when I bought my Strat. Write the bad songs as well as the good ones. I went through a faze of throwing out any idea if I didn’t immediately think it was great… but in reality the more songs you write (good and bad) the more ideas you can draw from. For example, I plucked a whole verse melody recently out of one of my discarded songs and used it as a middle 8 in one of the tracks I’m working on currently. And it works really well in that context!